The Girls Hostel constructed by SJGSM with UGC assistance was inaugurated by Shri.Rahulji Bajaj, President Shiksha Mandal, Wardha, on September 14, 2010 in the august presence of Vice President and Trustee Shri. Chandrashekhar Dharmadhikari, Chairman Shri. Bharatji Mahoday, General Secretary Shri. Sanjayji Bhargava, Trustee Shri. N.S. Jajoo, Trustee Shri. Madhurji Bajaj and all the staff members. On the occasion Shri. Rahulji Bajaj expressed that the facility of Girls Hostel would motivate the girl students from distant parts to join Shiksha Mandal parivar. Shri.Sanjayji Bhargava offered that more facilities will be provided to the deserving students in near future. Girls Hostel Inauguration by Shri. 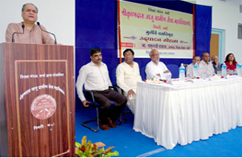 Rahulji Bajaj,President, Shiksha Mandal ,Wardha. The NAAC peer team visited the college for reaccreditations on 21st & 22nd December, 2010 and the college was reaccredited in ‘B’ grade. This grade is valid upto January 2016.